Organizations of any size can benefit from the practical fundraising advice in this book. If you volunteer for a nonprofit, parent-teacher association, or virtually any other community group, you've probably noticed that not even your hard work can keep the organization completely afloat -- to do that, you need cash. But when your small group is competing for donations with larger organizations who can afford to retain professional fundraisers, this task can seem impossible. Whether you're raising money for your PTA, helping out your child's sports team or music group, or trying to keep the local library afloat amid budget cutbacks, use The Volunteer's Guide to Fundraising to help you legally raise and handle money without running afoul of IRS rules, prepare grant proposals, and come up with a winning fundraising strategy. Use this book to make the most of your group's resources, no matter what size it is. What Type of Group Are You With? Incorporated, or Not? Will the Tax Authorities Take Bites Out of Your Group’s Income? Does “Nonprofit” Mean You’re Not Allowed to Make a Profit? What Protects You From Personal Liability If Your Group Gets Sued? Are Some Types of Fundraising Illegal? How Should You Handle and Safeguard Money? Why Do You Need to Raise Money in the First Place? Is Selling Goods or Services Right for Your Organization? Should Your Group Ask Individuals for Contributions? Is a Dinner or Food Event Right for Your Organization? How Much Planning and Work Will Be Required? Is an Auction Right for Your Organization? Is a Fair or Festival Right for Your Organization? Is a Benefit Concert or Lecture Right for Your Organization? What Are Some Easier Variations on the Benefit Concert or Lecture Theme? Is a Home or Garden Tour Fundraiser Right for Your Organization? Is a Competitive or Pledge-Based Event Right for Your Organization? Is Applying for Grant Funding Right for Your Organization? Having signed up to help out with a group’s fundraising efforts, you’re probably eager to dive in and make things happen. But before you do, take a moment to figure out the lay of the land. Understanding a few basics, like the legal ramifications of how your group is organized (incorporated or not), and your obligations vis-à-vis the IRS, will avoid many questions (and perhaps some problems) later on. Are the tax authorities keeping an eye on our group—for example, if we hold a bake sale or bring in other money, might we have to pay tax on it? If I and others donate money to our group, or rack up expenses due to volunteering, will these be tax deductible? Does “nonprofit” mean we’re not allowed to make a profit? Could our own money or assets be on the line if the group gets sued? How should we handle money that comes in? First, let’s start with some reassurance. Things will probably turn out fine. Both federal and state laws are mostly set up to protect volunteers and charitable groups, in order to encourage your work without overexposing you to lawsuits and tax hassles. And law enforcement authorities are not going to be spending a lot of time looking over your shoulders. But there are limits on what you can do, and potential trouble spots to avoid. It would be a shame if, merely for lack of knowledge, your group got embroiled in a lawsuit or lost its tax-exempt status. Many of the questions noted just above have answers that depend on how your organization is structured. Whether or not your group has incorporated under your state’s nonprofit incorporation laws and (after a separate process) received IRS recognition of tax-exempt status can make all the difference. If you don’t know, ask your group’s leaders. The processes of incorporation and applying for tax exemption are sufficiently worky that, if your group has done either or both within recent history, its leaders will not have forgotten. We’ll explain the consequences of each group type in later parts of this chapter. For now, the table below outlines the four major ways your group may be organized. The group has both successfully applied to its state to become a nonprofit corporation and also applied to the IRS for federal recognition of its tax-exempt status. It’s the obvious choice for those who want to establish an official presence or be ready for future growth. Incorporation allows a group to shield its directors and staff from personal liability. Tax exemption allows it to avoid paying taxes on certain types of income, and (under Section 501(c)(3) of the Tax Code) assure donors that their donations will be tax deductible. The group is a nonprofit that has filed for incorporation, but hasn’t applied for or received formal federal (or state) recognition of tax-exempt status. Yes, so long as the group is willing to live with the possibility of its income being treated like that of any ordinary business at tax time. Some groups really should be reporting and potentially paying taxes on their income, but don’t bother. A group may choose to go without tax exemption, perhaps because it doesn’t need to (churches and groups whose annual gross receipts don’t normally exceed $5,000, for example, are considered automatically exempt). Some groups think of themselves as having a charitable mission, but in practical terms, wouldn’t qualify for tax exemption, perhaps because they’re engaging in substantial business activities. The group has not applied to incorporate, but is an association that has gained IRS and possibly state recognition of its tax-exempt status. Yes. Incorporation is not a prerequisite to applying for tax-exempt status, though it can make it easier to get. Some groups figure they’d rather avoid the hassles of incorporation—at least for the moment—and face little risk of liability anyway, but would like the benefits of tax exemption. The group is an association that operates without either corporate or recognized tax-exempt status. Yes, although some groups really should be making themselves known to the IRS by reporting and potentially paying taxes on their income, but don’t bother. This avoids all the hassles of dealing with applications and fees, and is a common choice by very small groups such as a local native plant society or a cheerleading squad, whose donors may be more focused on the personal benefits the group offers rather than tax deductions. Any time money changes hands, you can count on the federal and possibly state tax authorities wanting to know about it—or at least wanting you to assure them that some of that money isn’t owed in taxes. With any luck, however, your group won’t owe a thing. The first deciding factor is whether your group has either been recognized as tax exempt or automatically qualifies for this status, most likely under Section 501(c)(3) of the federal Tax Code. We’ll look at some of the advantages to 501(c)(3) status in this section, as well as whether and when it makes sense for very small groups to put off applying to the IRS for determination of their tax exemption. What Does It Mean to Be Tax-Exempt? in states that follow the federal exemption (as most do, either auto­matically or after the nonprofit files an application), avoid paying state income, property, and sales tax as well. preventing cruelty to children or animals. Nevertheless, Section 501(c)(3) is not the only exemption out there. For example, many groups whose main purpose is social, recreational, or business-related are not eligible for 501(c)(3) status. But they might instead apply to be a 501(c)(5), which is meant for labor, agricultural, and horticultural organizations; a 501(c)(7), for social and fraternal clubs; or a 501(c)(4), for civic leagues, social welfare organizations, and local associations of employees. The 501(c)(3) organizations enjoy a particular advantage over other 501(c) groups. While the non-(c)(3) groups won’t have to pay taxes on income, their supporters won’t be able to claim tax deductions for donations. Such groups can still legally raise money from others, but can’t offer this added incentive toward giving. The tax deductions available to volunteers at a 501(c)(3) nonprofit may not add up to big dollars, because volunteers can’t deduct the value of the actual hours they put in. Even a highly skilled volunteer, such as a graphic designer or lawyer, can’t deduct the value of time spent helping out your group. Car and transportation expenses. Volunteers can deduct the cost of using their cars or other transportation as they go back and forth from their homes to your worksite, or to meetings or other sites (such as a special event, or to deliver food to a homebound senior). For driving, volunteers will need to choose between deducting actual gas and oil used, or taking a mileage deduction at the rate of 14 cents per mile (2011 tax figures—note that the allowed deduction is always shockingly lower than that allowed for business-related mileage deductions). Given the high cost of gasoline today, most volunteers are better off keeping track of actual driving expenses. Volunteers can also deduct parking fees and tolls; and those taking public transportation can deduct those costs. Travel expenses. Volunteers can deduct travel expenses such as airfare and other transport, accommodations, and meals when working for your ­organization away from home. This might include trips to attend a convention or board meeting, taking schoolkids or scouts on a camping trip, or monitoring environmental destruction. However, the deduction won’t be available if the volunteer gains significant personal pleasure, recreation, or vacation from the travel. (Don’t ask how the IRS expects to monitor how much fun your volunteers are having!) The volunteer must also really be working—tagging along on an outing while performing nominal duties, or even no duties for significant parts of the trip, won’t cut it. Other out-of-pocket expenses. Board members, for example, might deduct unreimbursed phone, postage, and copying charges associated with preparing for meetings. Volunteers at an animal rescue facility can deduct the treats that they’re asked to provide in order to help train animals. Sunday school teachers can deduct classroom supplies. Uniforms. If you ask volunteers to purchase a uniform and wear it while performing services—for example, an apron identifying them as an event helper—they can deduct both the purchase price and any upkeep costs. However, the uniform must not be suitable for everyday use (providing a T-shirt with a logo or asking ushers to wear black, for instance, won’t be enough). Volunteers should keep reliable written records or other receipts in order to back up their deduction claims in case of an IRS audit. How Does a Group Become Tax Exempt? An organization that wishes to be treated as exempt under Section 501(c)(3) of the Tax Code must give notice of this fact to the IRS, and receive IRS approval. This is done by filing Form 1023, along with supporting documents and financial data, within 27 months of the group’s formation. If your group needs information on the details of this process, see How to Form a Nonprofit Corporation (national edition), by Anthony Mancuso (Nolo); or How to Form a Nonprofit Corporation in California, by Anthony Mancuso (Nolo). Some groups operate under a group exemption through their subordinate affiliation with a “central” or parent organization. For example, groups that join Parent Booster USA, a nonprofit formed by adviser Sandra Pfau Englund (whom you’ll meet in Chapter 2), receive immediate federal tax-exempt status via their membership, without having to separately apply in their own name. Churches and local Boy Scouts groups also make use of these group exemptions. As an alternative, you might ask an established nonprofit organization—one with a similar mission—to become your “fiscal sponsor.” This allows you to basically ride on the other group’s 501(c)(3) coattails (typically for a fee of at least $100 a month), while it handles any money you receive and assumes legal and financial liability for your activities. You can offer donors the right to claim tax deductions, and rely on the sponsoring organization to report and fulfill other requirements to the IRS and your grantmakers, plus help out with payroll, insurance, and other “back office” services (potentially saving you from hiring accounting and other administrative staff). But your group is not considered a 501(c)(3) in its own right, and your sponsor has primary control over any donations made to you—and indeed, over your whole group, if it chooses to wield that power. If you haven’t chosen a well-managed, trustworthy organization, you could find yourself chafing under the control, or having to double-check where your money has gone. Therefore, this is typically a temporary measure used by groups working their way toward a 501(c)(3) application. For more information and lists of currently active fiscal sponsors, see www.fiscalsponsordirectory.org. A number of groups decide to avoid the hassle of applying for tax exemption, and operate without formal recognition of such status—even beyond the groups that are considered automatically exempt because, for example, they’re religious organizations or their gross receipts fall under $5,000 a year. Nevertheless, your group will be in a much better position to raise money if it has already obtained such recognition. Also, if and when you try to broaden your donor base, you’ll find it increasingly important to tell prospective donors with confidence that gifts to your organization are tax-deductible. They can still try deducting their contributions to you without this recognition, but if they’re audited, and the IRS auditor isn’t convinced that your group meets the 501(c)(3) criteria, both the donor and your group could be in for trouble. Is It Worth Keeping Your Gross Receipts Low Enough for Automatic Exemption? The short answer is, “No.” Maintaining a normal level of gross receipts below $5,000 puts an absurdly low ceiling on your activities, especially after you understand what gross receipts really means. Take special note of the part of the definition that says that costs and expenses are not omitted from gross receipts. Let’s say your group earned $5,500 from holiday wreath sales last year, but paid $5,000 to the wreath maker, so that your profit was only $500. The gross receipts from that venture alone are still $5,500. if your group has been in existence for at least three taxable years, its aggregate gross receipts from the preceding two tax years, plus the current year, add up to $15,000 or less. So, your group could, for example, bring in $7,000 in its first year and still not need to file for tax exemption; another $4,500 in its second year and still not need to file (because the aggregate hasn’t exceeded the $12,000 limit); and another $3,000 in its third year, and remain just at the allowable three-year total of $15,000. As soon as your group realizes that it has exceeded any of the limits described above, the IRS gives you 90 days within which to submit a Form 1023, requesting official determination that you’re tax exempt. So if your fundraising has even a chance at regularly bringing in $5,000 or more, it really would make sense to apply for tax exemption now, rather than fret over the numbers. paying tax if your group brings in certain types of income, especially from activities unrelated to its charitable purposes. Had trouble filing the online Form 990-N? At the time this book went to print, filing Form 990-N was difficult for groups that hadn’t already received IRS recognition of tax exemption, due to the way the IRS computer system is set up. You could deal with this by calling the IRS 45 days before submitting Form 990-N, giving the IRS time to set up a computer file for your organization. It’s possible this problem will have been solved by the time you read this (or the solution changed), so check with other nonprofits or your tax pro. Groups whose receipts are normally higher than $25,000 a year must file either a full Form 990 or a midsized Form 990-EZ. These tell the world about the group’s activities (demonstrating that it still meets the qualifications for tax-exemption), and about matters like the group’s executive salaries and program expenditures. income from business activities that operate mainly for the convenience of your group’s members, students, patients, officers, or employees (as with an on-site hospital pharmacy or coffee shop). But if a tax-exempt nonprofit starts regularly operating a business that’s not substantially related to its nonprofit purposes, and earns more than $1,000 a year at it, its income may become what the IRS calls “unrelated business income” (UBI) and subject to tax at federal corporate rates. That doesn’t necessarily mean you’ve done anything wrong, as long as the business activities remain a minor part of what your nonprofit does. It does, however, mean that you’ll have the hassle of computing (and paying) the tax you owe. The fundraising strategies described in this book are unlikely to draw you into the realm of UBI. But it’s something to keep in the back of your mind. What if, for example, someone in your group suggests, “Let’s buy a coffee cart and hire someone to operate it on the sidewalk outside our building for passersby, and use the profits for our programs?” Not a bad idea—but the resulting income would in all likelihood be considered UBI, so you’d have to remember to figure federal and probably state income tax obligations into your estimates of profits. (And who wants to worry about computing and paying state sales tax, which might also apply?) Then there’s the worst-case scenario: If the coffee-cart project got so big that it took over the purpose of your nonprofit, perhaps with carts on various street corners throughout your city, your group could actually lose its tax-exempt status. If your group has received federal recognition of tax exemption, your state’s government is likely to honor that as well (though you may need to apply for confirmation of your exemption). But this isn’t always the way it works—some states simply exempt all nonprofits, while others require them to submit a separate application for state tax-exempt status. You’ll need to check with your state’s tax-regulating authorities to find out the details. A nonprofit is expected to work for the public good, motivated by a mission other than making money for individual shareholders or business owners, as is the case with for-profit enterprises. But obviously, you need to make enough money to carry out your good deeds. And you don’t have to give everything away for free, work within a bare-bones budget, or never set money aside for the future. Nothing could be further from the truth. For starters, if you’re providing goods and services to the public, you’re allowed to ask people to pay for them. This is true whether you’re dealing directly with clients, perhaps low-income people, or with others. Of course, when dealing with clients, it won’t serve your mission to try and make a financial killing off of them—but setting at least nominal fees can both help your group’s finances and remind clients that you’re providing something of value. In the case of selling goods and services to the public, what you charge is limited only by what you need to do to protect your tax-exempt status—for example, if you haven’t yet formally applied for tax-exempt status and are trying to keep your gross receipts to a level that’s normally below $5,000 a year, then you obviously wouldn’t want to start selling expensive goods. And venturing too far into the territory of unrelated business income could threaten your tax-exempt status. But these are outside limits, and don’t stop many nonprofits from, for example, selling baked goods, greeting cards, tickets for tours, and much more, sometimes at higher-than-market prices. Then there’s the matter of setting some funds aside for the future, or for a rainy day. In an unhappy coincidence, on the very day I’m writing this, the Humane Society just one block from my office is trying to recover from a devastating midnight fire. Yes, property insurance will cover rebuilding, but it won’t cover other costs like continued medical care for the animals that they’re placing in temporary foster homes and the fundraising costs to ask the public to help. It’s not easy to set aside money when very little comes in to begin with, but if you choose a small percentage and stick with it, it will start adding up. Aim for a six-month surplus. There’s a reason we asked you to find out whether your group has become a nonprofit corporation, as opposed to remaining an unincorporated association. Incorporation is an important step in protecting people associated with a group from personal liability for lawsuits. Your Group Has Incorporated: How Does That Help You? If your group has become a nonprofit corporation, this means that it has arranged with a state office to become a separate legal entity—in fact, has become legally equivalent to a separate person. It will have filed articles of incorporation, paid a fee, adopted bylaws, appointed a board of directors, and so forth. The incorporation process is similar to that undertaken by for-profit businesses, except that nonprofit corporations don’t have shareholders or issue dividends. Once formed, the corporation can sign contracts, enter into debts, and pay taxes in its corporate name. Its separate existence also acts as a shield, protecting its board, staff, and members from personal liability for mistakes made during the course of their duties as directors, employees, and members. That means that if someone sues your group—perhaps a cookie company to which it owes money, a local personality claiming slander for a portrayal in your group’s newsletter, or a visitor injured at your holiday bazaar—the person suing will have to name your group as the defendant (and not individual members or volunteers) and claim any damages from the group’s funds (not from any individual’s personal assets). If your nonprofit corporation has insurance—which it should—any claims, settlements, and verdicts can be satisfied with insurance proceeds. Exceptions do exist, however, for cases in which a group’s board, staff, or other member behaved badly enough to be found personally liable. The most likely examples are when someone within your group personally and directly injures someone, or deliberately misuses nonprofit funds. In addition, if a group representative personally guarantees a bank loan made for the corporation’s benefit but then defaults, the bank can demand payment from the individual (which, of course, was the point of asking for the personal guarantee). In short, if your group is an incorporated nonprofit, you can feel pretty comfortable that, unless you do something seriously out of line, you’ll be protected from personal liability. But don’t panic if your group hasn’t incorporated—there are other ways in which you may be protected, as discussed next. Many small groups, such as garden, bridge, or ethnic clubs, do just fine without incorporating. An unincorporated association can still be called a “nonprofit.” And it can carry on its regular activities without feeling that it has to have “official” status. These groups aren’t operating in a shady, underground manner; we all have a constitutional right to gather. Also, many states’ laws govern unincorporated associations in the same way as they do incorporated nonprofits. You’re a volunteer, protected by federal law. The federal Volunteer Protection Act (VPA), passed in 1997, says that unpaid volunteers for groups that operate for public benefit and primarily charitable, civic, educational, religious, welfare, or health purposes, enjoy limited immunity from liability. So long as you, personally, were acting within the scope of your volunteer responsibilities, with any necessary licenses, certification, or authorization, and didn’t do something intentional, criminal, reckless, or grossly negligent, and weren’t driving a vehicle, boat, or aircraft, you’re protected from liability. Your group doesn’t engage in high-risk activities. If, for example, you’re working with a music club or an organization dedicated to raising funds to restore a local fountain, it’s unlikely (though not impossible) that you’ll face the expensive suits arising from personal injuries. Your group has taken out insurance. Many groups’ general liability policies cover staff and board members against lawsuits. Adding coverage for regular volunteers is also possible, and possibly worth looking into for your group. In the meantime, if you’ll be holding events or conducting activities where people might get hurt, consider asking a lawyer whether drawing up a waiver (in which the participant gives up the right to sue you if your carelessness causes injury) would be legally effective in your state, and if so, to draft one for your group. Then ask participants to sign the waivers when they sign up or show up for your events. Your state’s laws protect members of groups like yours. A number of states have passed legislation protecting members of unincorporated associations from personal liability. In fact, several of these states have adopted what’s known as the “Uniform Unincorporated Nonprofit Association Act,” or “UUNAA,” giving unincorporated nonprofits the status of a separate entity when it comes to liability. People working for this entity can’t, under most circumstances, be held liable for its actions. Your group should also implement commonsense strategies to protect against the most likely risks. Sit down with your organization’s leaders (or fiscal sponsor) and discuss what these are—whether injuries, debts, or something else—and how to deal with them. For example, if you’ll have a lot of volunteers working directly with children, it’s wise (and in some states, legally required) to carefully screen the volunteers (including a background check for criminal infractions). We’ll explain how to do this in Chapter 2. Incorporating has its benefits, as you can see. But if your group is small enough—and plans to stay small or even disband in a few years—and your activities don’t present substantial risks, don’t feel pushed. Perhaps dealing with the administrative requirements and paying the fees aren’t worth it. If your group has growth plans in its future, however, formalizing your organization might make sense—in fact, it might aid in your growth plans. Grantmaking foundations typically restrict their giving to nonprofit groups that have both incorporated and filed for recognition of 501(c)(3) status. Formalizing your status as a separate organization will also help you when it comes to fundraising. Oftentimes, prospective donors to public institutions (such as public schools and libraries) worry that their money will get sucked right into some distant government budget, perhaps never to be seen by your school or library again. By incorporating and gaining formal status as a 501(c)(3) in your own right, you can reassure people that their donations will go to straight to your organization. If you think it would be a good idea for your group to incorporate, it’s never too late to do so. If, however, your group received tax-exempt status (discussed above) before incorporating, you’ll have to reapply for it under your new, corporate name. File an annual return. No tax on income related to charitable purposes; but tax owed on unrelated business income (UBI). If exempt under Section 501(c)(3), donors can take tax deductions for gifts. File an annual return. Pay tax on all forms of income (unless qualified for automatic tax exemption, in which case your group will be treated like a tax-exempt organization, described above). File an annual return. No tax owed on income related to charitable purposes; but tax owed on unrelated business income (UBI). If exempt under Section 501(c)(3), donors can take tax deductions for gifts. Staff, directors, and members must rely on insurance and other risk-prevention laws or measures. Now that you know some of the ramifications of incorporating (or remaining an unincorporated association), take a look at “Why Organizational Structure Matters,” above. This table summarizes the personal liability and tax consequences of the four ways to structure your organization, introduced earlier. In some localities, you’ll need separate permission before carrying out certain activities. Or, you may have to follow local regulations or heed restrictions on specific types of fundraising. Commonly regulated activities include door-to-door solicitations, selling baked goods or other foods, raffles, and bingo games. For example, you may need to get a permit in order to hold a garage sale or bake sale. A liquor permit may also be required if you plan to serve or sell beer or wine at your group’s event. And holding a raffle may be entirely illegal (as in Alabama and Hawaii, where raffles apparently resemble gambling too closely for governmental comfort), or you may need to apply for advance permission to hold raffles (as in New York and Indiana). Exactly which government office you’ll need to check with depends on where you live. It may be the state attorney general, the local police, or a finance, tax, licensing, or commerce department. The chapters that follow address each type of fundraising, with information on the most common restrictions and requirements. Every single one of your group’s fundraising activities may actually be illegal if you haven’t yet registered your group and its fundraising intentions with state, city, or county authorities—and kept up your registration with annual renewals. There’s no nationwide law requiring this, but state and local registration laws are on the increase. And they’re being enforced more than ever, by authorities hungry for new sources of revenue. If the notion of registering surprises you, that’s understandable. Although such laws have been on the books for some time, they were regularly ignored by the IRS. Most nonprofits didn’t need to worry about registering until 2007, when the IRS added a question to Form 990, inquiring whether the group had complied with state registration requirements. Failing to register, at least in your own state or locality, may subject your group to fines or prohibitions on fundraising until after you’ve registered. Worse yet, the liability may extend to individual board members. The scandal resulting from noncompliance won’t help your group’s reputation, either. To avoid trouble, start by checking with your local government offices regulating businesses. At least make sure you’ve met the registration requirements for the area where your office is located and where you solicit your donations. following 11 states: They don’t require nonprofits to register. All of the registration states and the District of Columbia grant exemptions to certain types of groups, however. There’s a good possibility you fit into one of these exemptions. For example, all states except Arizona exempt churches and religious organizations from registering. Some states exempt nonprofit libraries, educational organizations, groups that solicit funds only from their members (such as fraternal, social, or alumni organizations), groups raising money to help a particular person (for example, a medical fund), or groups whose annual receipts of individual, nongrant donations—from all states, not just the one in question—are below a certain amount. That amount currently ranges from $1,500 to $50,000, with $25,000 the most typical figure. In a few states, having only a small number of donors will also qualify your group for exemption. The trouble is, not all states grant all the exemptions just described, or even the same set of exemptions. For example, some require even tiny groups to register, regardless of how low their revenues or how few their donors. Some states count grant funding as revenue. Therefore, you’ll need to look further into the matter if there’s any chance your group, or anyone working on its behalf, will be making requests for charitable contributions from donors of other states—including via your website. If you determine that you’re exempt for the moment, great—but don’t stop your inquiry there. For one thing, 12 states won’t grant you the exemption automatically. You’ll need to apply for it, and in some cases pay a fee. Also realize that you could lose your exemption in the future, possibly quite unintentionally. For example, if your revenues go up, your group is given a few moments on national television to pitch your cause, or you team up with a corporate sponsor that will be selling products nationwide featuring your logo and information on how to contribute, you may need to start registering in a number of states. Looking for more information on the complex topic of state registrations? 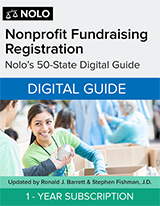 You’ll find information to help you deal with registration, including discussions of when the requirements are triggered by Internet and email fundraising, in Nonprofit Fundraising Registration: The 50-State Guide, by Stephen Fishman (Nolo). thank the donors, for the sake of politeness and IRS rules. If your group has no separate bank account, where will you put money that comes in? Unless you put your faith in mattresses and freezers, it’s most likely to go into one of your group leader’s bank accounts. In that case, however, the person would need to report the money to the IRS as income. A better option is to open up a bank account for your group. This is a fairly simple process. You’ll need a federal Employer Identification Number (EIN) first, but can easily get one online, at www.irs.gov (search for “EIN”). Money has an unfortunate way of disappearing, even in an environment where you think everyone is friendly and trustworthy. So your number one goal, whether you’re accepting donations in person, by mail, or at an event, is to get the money into a safe place, for example by instituting the following measures. Designate a person or persons at your organization to handle finance matters, including collecting money and making deposits to the bank account. Develop a clear timeline and system for transferring cash and checks to that person. Minimize the number of people handling money. For example, at events involving games and food, use a central cash box that sells tickets for both (thus avoiding multiple cash boxes at different booths). One of your finance people should regularly stop at this main cash box to remove extra money (beyond what’s needed for making change) and put it in a safer place. At ongoing fundraisers (such as a week-long membership drive), use an on-site safe or locked drawer where money can be kept temporarily until your finance person is ready for a bank run. For example, school fundraisers might use the desk in the principal’s office. Consider setting up credit card or PayPal accounts. Credit cards are convenient for the donors, avoid the transfer of real money, and don’t bounce like checks. For many small groups, however, the effort it takes to set up a credit card account isn’t worth the effort. The next best thing is to use a service like PayPal, allowing donors to transfer money online; see www.paypal.com. Whether you’re answering to an individual donor (“Did you get my check?”) or to an IRS auditor (“Where are the receipts for this?”), being able to say where money came from—or went to—is critical. Your grant funders, as well as your state government’s oversight branch, may also take a keen interest in your group’s finances, and require it to submit an annual financial report. The best practice is to keep a record of every cent that passes in or out of your organization’s hands (as well as of all correspondence with donors, a topic we’ll discuss in Chapter 6). Let’s say you’re an event-planning volunteer with a parent-teacher organization, and a parent hands you a $50 cash donation. It may seem like the most natural thing in the world to turn around and spend that money on balloons for the event, but that’s not a good idea. Instead, you’ll need to give the donor a receipt on the spot (even if it’s only handwritten on a blank sheet of paper), transfer the money to your group’s finance person, and either request petty cash to pay for the balloons or use your own funds and request reimbursement later—having, of course, saved the receipt for the balloons. That way, the donor will be reassured that the money was recorded and the organization will be able to keep accurate records of who has donated and how much, along with how much was spent for event costs. That said, it’s true that there’s no actual law saying you have to give a receipt to everyone who gives your group money—in fact, IRS rules for 501(c)(3)s require giving receipts only for gifts of $250 or more. Nevertheless, providing receipts for smaller gifts is a good idea. Relatively new IRS rules demand that donors claiming tax deductions keep receipts for all donations, regardless of amount. A bank record will work for checks or credit card donations. But if a donor makes a cash donation, claims it as a tax deduction, and is later challenged on the legitimacy of the deduction, the donor won’t have a record unless you’ve supplied it. It’s simplest—and better for donor relations—to send a receipt regardless of the amount donated. Written receipts also avoid suspicion and disputes, along the lines of, “Why are you asking me for my dues when I already gave $50 to Joe last week?” We’ll show how to draft thank-you letters that incorporate receipts for donations in the next section. Make sure that everyone who might accept or handle money for your organization knows these basic principles. For someone who’ll be regularly receiving money, pick up an actual receipt book from an office supply store. A good cautionary measure is to give not one, but two people the ultimate power and responsibility for handling your group’s money. Both should be responsible for checking the other one’s work. Drawing checks from your group bank account should require both signatures. No matter how trustworthy they each are, mistakes happen, and everyone will appreciate catching these early and internally. A policy stating that anyone from within your group’s leaders or members can examine your group’s finance books at any time is also helpful, and serves to project a positive image to the public. For the most part, your group will solicit funds for its general purposes, as you do, for example, when inviting people to “Buy brownies to help the school marching band!” There’s nothing wrong with using those donations for any valid project or purpose—you haven’t earmarked the expenditure. But be careful that you don’t accept money that’s designated for a specific, limited reason, then use it for something else. For example, it’s a mistake to say, “Buy brownies to help the school marching band travel to England!” but end up using the excess earnings on new uniforms or to raise the director’s salary. Such actions would violate the donor’s wishes, which might not only upset the donor (or soon-to-be ex-donor), but supply potential grounds on which to sue your group. Thanking donors early and often is one of the most important tasks for anyone involved in raising money—and one that often gets overlooked. It doesn’t matter that your group is full of committed supporters who see a direct benefit from the money they put in. Even if it’s their own kids who get to participate in school sports, or their own mosque that gets a remodel, everyone likes the recognition of being thanked, the affirmation that their contribution made a difference, and of course the proof of any tax deductions they’re due. On the flip side, people who don’t receive acknowledgment get disgruntled, and start thinking your group isn’t very well managed. So, having made a point of carefully recording every donation that comes in, be sure to follow up by sending out a thank-you letter soon after. A postcard or an email may be acceptable, depending on the culture of your supporters (and both are okay by the IRS, whose requirements we’ll discuss next). But real mail adds a note of thoughtfulness. In fact, we know of instances where donors so appreciated the personal touch that they sent thank-you letters in response to the thank-you letters! The basics, including your organization’s name and the donor’s name. If the donor is a business, include both the name of your contact there, his or her title, and the business’s name and address. Whether the donor received anything of value in return for the gift other than a token or low-cost item (such as a tote bag or stickers; for more information on this, see “Token or ‘Low-Cost’ Items,” below). If so, you must state the amount of their contribution that’s tax deductible after subtracting the fair market value of what they received. For example, if a donor bid $90 at an auction for a fruit basket that retails for $50, the tax-deductible portion of the contribution is $40. We hope you enjoyed this material. The rest of this chapter is available when you purchase the book.